Burger King has debuted a new sandwich featuring a red colored bun. The bright red color is to signal that it is a hot spicy sandwich. 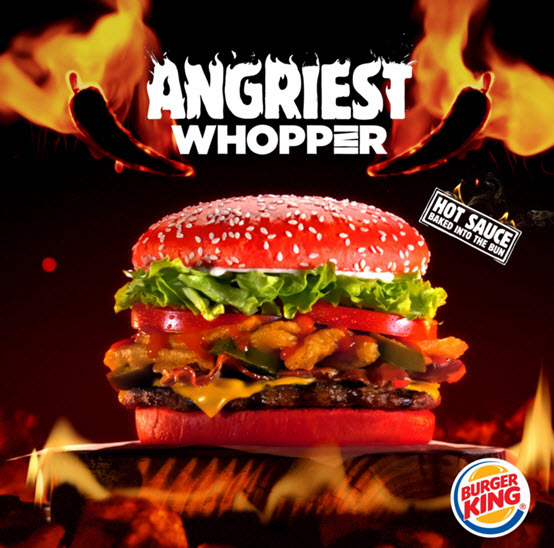 The Angriest Whopper sandwich also contains a spicy angry sauce. Burger King also featured a colored bun last Halloween. The A.1. Halloween Whopper had a black bun with A.1. sauce baked into it. Burger King CMO Axel Schwan says in the announcement, "Our A.1. Halloween Whopper with the black bun was a successful launch and our previous limited time Angry Whopper sandwich was a hit with guests. So, we're combining the power of these past hits into a star-studded sandwich we think our guests will unanimously agree is the next must-eat burger." The Angriest Whopper contains flame-grilled beef, bacon, American cheese, flaming onion petals, jalapenos iceberg lettuce, tamotoes, mayonnaise and the spicy angry sauce. The red bun also has hot sauce baked into it. The limited time burger will cost $5.49 alone or $7.49 in a combo meal with a small drink and fries. The burger has 830 calories and 59 carbs. You can find the nutrition information here.